Hydraulic log splitters are powerful devices designed to easily transform logs into usable firewood. If you're looking for a manual hydraulic log splitter, we recommend the Powerhouse 7 ton hydraulic log splitter- this 104 lb., portable log splitter can work with logs that are up to 20 1/2 inches long and 12 inches in diameter. If you're interested in an electric hydraulic log splitter, we recommend the Wen electric log splitter- it uses a 2 hp motor and can work with logs that are up to 20 and half inches long and 10 inches in diameter. One Powerhouse user describes having been able to clear out a half acre of pine, oak, black birch and maple all in one afternoon- he describes his hydraulic log splitter on logs up to 24 inches in diameter, with even knotty logs being split without any problem. Wen users say that the log splitter is a little bit smaller than they expected, but incredibly powerful (needs a thick extension cord to give it enough juice), and that you can move it around and store it in the same way as a hand-truck. Let's take a look at five of the best-selling hydraulic log splitters on the market today and see how they compare. The 10 Ton Horizontal Log Splitter is a hydraulic log splitter that can generate a maximum of 10 tons of force- that’s enough force for a user to be able to split logs that are at least 18 inches long and as thick as 6 ½ inches. Buyers have found this a very useful splitter, especially if you are someone that needs to split a lot of wood for a fireplace or wood stove. Buyers commend how easy this hydraulic log splitter makes it easy to split wood and how much faster it is than the old traditional way of axe-splitting wood. Another thing that many users like about this unit is that it has two wheels on it so it makes it a lot easier to move around because the hydraulic log splitter itself is quite heavy and would be rather difficult to move without the convenient wheels. Reviewers were surprised that it was quite easy to assemble except for the springs, which were a little difficult to install. Overall, users like how well-built, sturdy and strong this hydraulic log splitter is, making it a very reliable product to use for splitting acres of logs. 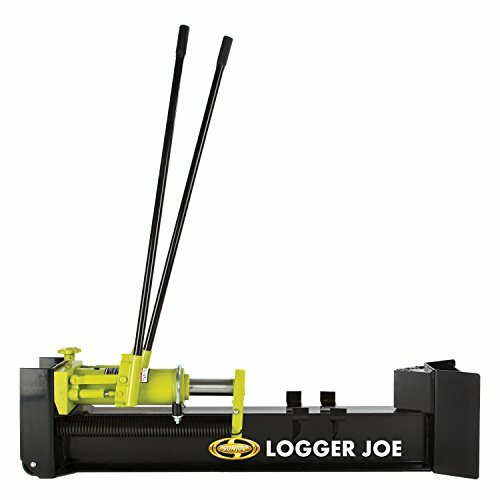 The Sun Joe Logger is a hydraulic log splitter that can easily split logs that are 18 inches long and 8 inches wide with it powerful hydraulic ram that can build up to 10 tons of force to help get the job done. One feature buyers like is that it has a two-speed pump which makes it quicker to generate the 10 tons of force to easily split the wood they need for their wood stoves or fireplaces. Most users found this hydraulic log splitter fairly easy to use and writes that it doesn’t require too much strength in order for it to get up and running. It has rear wheels that help users move it around easier- and it is constructed of durable steel so that it can handle most any workload. Buyers like its compact size because it makes for easier storage when they are not using it. The only thing some users didn’t like was the handles- some users felt they should be longer to help cut down on back strain from using the machine. 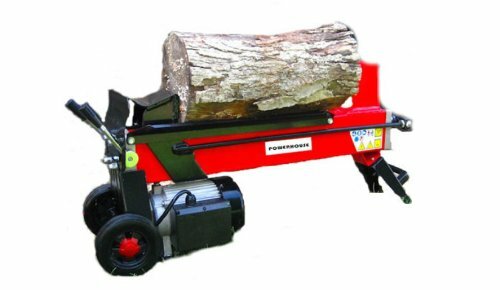 The Ironton Horizontal Manual Hydraulic Log Splitter is a log splitter that includes a nice ‘log cradle’ feature, which helps to keep the split wood from falling off onto the ground- a lot of users found this convenient. 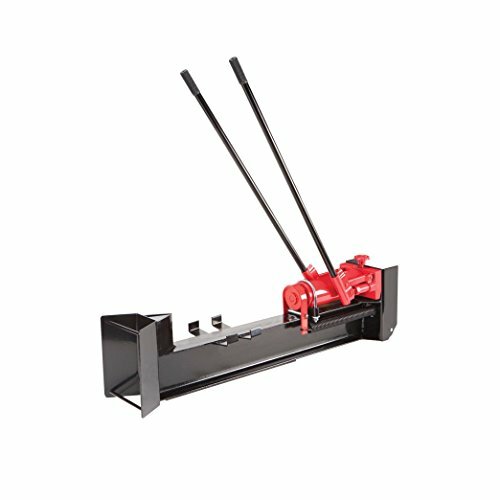 This hydraulic log splitter will easily split logs that are 13 ½ inches to 18 inches in length and 6 ½ inches in diameter. Buyers like its sturdy and rugged construction and how easy it is to use. Users also endorse the wheels attached to the hydraulic log splitter because it makes it a lot easier to move it around to where you need it to be. 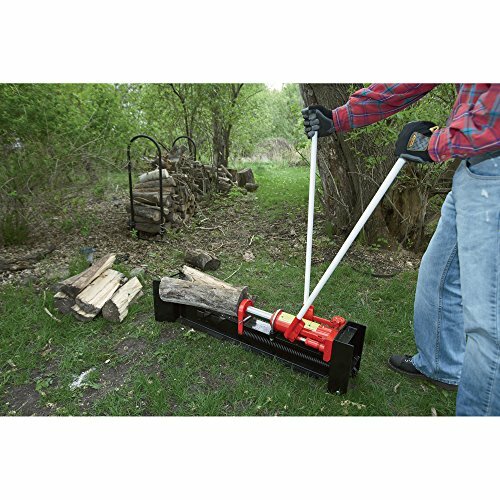 Reviewers commend the two-speed pump, which allows it to build up the 10 tons of force needed to split the logs making the job of splitting logs much quicker and more efficient. This hydraulic log splitter has two steel handles on it that help to operate the pump and creating good leverage to split the size logs users need for their wood stoves or fireplaces. The Powerhouse 7-Ton Electric Hydraulic Log Splitter has a 3 horsepower motor, is pretty portable and is also electric. This is a key feature many users seem to really like about this hydraulic log splitter. Another feature many users like is that this hydraulic log splitter can cut logs up to 20 ½ inches long and 12 inches in diameter. This hydraulic log splitter can actually help a user to split over 100 logs in under an hour without much strain, users report. It helps to eliminate the risk of injuries (back strain and hand accidents) and makes it easy for just about anyone to split logs. Users enjoy the fact that this hydraulic log splitter is able to split a lot of different woods, some of which other splitters have been unable to handle well. This hydraulic log splitter is also very easy to move around with it wheels making it easy to position wherever you might need it to get the job done. One of the top things that reviewers like about this hydraulic log splitter is that it lives up to the hype that it can split a cord of wood in about an hour or so. Some users did complain that this splitter sometimes stalls when it hits a knot in the wood. The WEN 6-Ton Electric Hydraulic Log Splitter is a log splitter with a 2 horsepower and copper wound motor that actually can use normal household electrical current- you just have to plug it in and off you go. Reviewers like the built-in log cradle that also serves as a guide to keep the logs on track so the user can make even cuts. This splitter can handle logs up to 20 ½ inches in length and 10 inches in diameter which makes it a lot easier for users to get just the right size logs they need for their fireplaces or wood stoves. This hydraulic log splitter is portable- with its two easy-to-grip handles and the 6-inch tires it has, making it quite easy to move around. Users like how compact it is and were surprised at how powerful it is being so much smaller than a lot of other splitters on the market. Reviewers have found it to be very easy to use as well as quite quick to cut. One thing users really didn’t like was that the manual that comes with it was really horrible and really not very helpful. Also, some users felt the end caps on the ram of this hydraulic log splitter are cheaply made. Log splitters are a great way to plow through all manner of wood- whether it be birch, maple, cedar, and elm trees- you can work through acres of trees, creating ideal firewood. 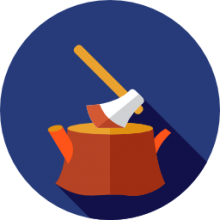 Particularly if you have a fireplace or woodstove, or if you ever need to split wood on your property, these are essential tools to have. It used to be that you would need to split these logs by hand, swinging an axe, it can take a long time and it is very hard on the body, particularly if you are an elderly property owner. The process becomes much easier and quicker once you begin using one-though you will still need to do some work finding the right-sized logs, loading them into the splitter, and also maintaining your hydraulic or electric unit over time. One user who purchased the powerhouse electric hydraulic log splitter was particularly pleased- he writes that living in Canada on an island property that they are surrounded by unseasoned pine trees as well as ash trees and he is accustomed to using gas-powered, splitters that are very expensive to purchase and operate. He was pleased with the affordability of the Powerhouse tool saying that its speed is comparable to the more expensive and industrial-sized, gas-powered options, but you can purchase several of these smaller models and get a lot more done if you have a team helping you. Another satisfied Powerhouse customer writes that they primarily use their tool on cherry and ash trees, routinely working on wood that's over 20 inches without any issue- and powering it using a 50 foot extension cord. One interesting comment this user made is that when it encounters a knot or burl that it cannot process, the hydraulic fluid will then bypass and the unit will stop working. He said that this is a good feature because it prevents the tool from overloading. 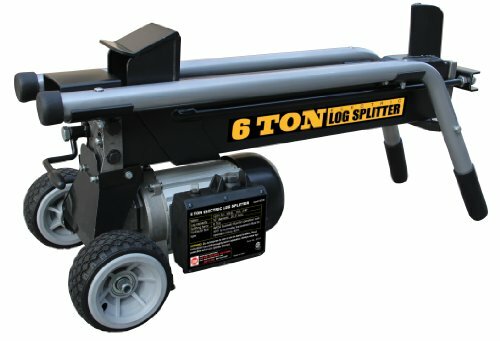 If you are looking for an easy and powerful way to split logs on your property, consider purchasing one of these electronic, hydraulic log splitters- they are frequently backed by long warranties and are pretty rugged and mobile tools that will last you a long time if properly maintained.